You are in such a time again! Apple released the newly masOS Sierra, attracting Mac users to upgraded to macOS High Sierra. You benefit from the brand-new macOS Sierra features, for example good compatibility with various Macs and convenience brought by Siri. But you will later find that you are not allowed to download videos on macOS High Sierra since the existed video downloader on your Mac is incompatible with the fresh macOS High Sierra. What should you do? Get a video downloader for macOS High Sierra first! And you can save videos on macOS Sierra/High Sierra as you did on OS X El Capitan or Yosemite etc. Whereas it's always tough to make a choice. Here shares the best 6 tools to make the selection process easier. To judge a video downloader is good or bad, many aspects needs to be checked such as permitted video download sites, supported video format/resolution, downloading speed, Mac OS compatibility etc. And the Mac OS compatibility precisely can be the prerequisite of a good program. Here are 6 video process programs for macOS Sierra, which win the entrance ticket of being the best video downloader for Mac. MacX Video Converter Pro updates very soon, which ensures to be compatible with the latest macOS Sierra or portable devices. It's no wonder to be the best video converter for macOS Sierra/High Sierra since it keeps the same steps of trending. Besides, it can download virtual reality 360 degree video, 4K/8K UHD, 1080p full hd, 720p video from YouTube, Facebook, Dailymotion, and 300+ sites with whatever video/audio formats. As for the speed, the built-in multi-core CPU utility allows you to activate your 8 CPU cores to simultaneously download video, 800% faster than single CPU core. Plus, it's the world's first video downloader to support Intel QSV tech to speed up video downloading speed 5X faster than any other. iPubsoft Video Downloader for Mac is a handy tool that can help you to save and download videos on Mac (macOS Sierra included) from various video sharing sites, such as YouTube, Vimeo, Video Bash, Break, Metacafe, etc. 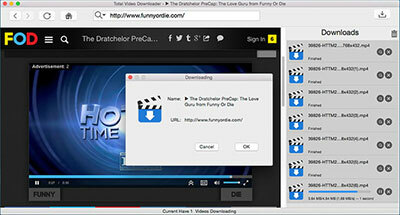 And multi-formats such as MP4, WebM, MOV, FLV are allowed to be downloaded with this best video downloader for Mac. Moreover, you can also customize your target video by setting the video format and resolution, etc. as you need before downloading. All in all, it provides users a clean and handy way, straightly search for the video, copy the video's URL (web address) and paste to complete free video downloading process with fast speed. Similarly, Kigo Video Downloader for Mac can free download any videos from YouTube, Facebook, Vimeo, Veoh, Dailymotion etc. What worth mentioning is that it accepts up to 1000+ websites videos downloading. As a totally free video downloader for macOS Sierra, it enables 4K 4096p, HD 1080p, HD 720p, 480p, 360p, 240p videos downloading in MP4, FLV, WebM. Besides downloading videos, Kigo Video Downloader for Mac also behave well in converting videos to AVI, MP4, 3GP etc. In a nutshell, it is very simple to batch process videos on macOS Sierra and convert them with high speed, even you are a fresh man. 1. Download video from YouTube, Facebook, Dailymotion, etc. 300+ sites. 2. Support downloading 360 degree virtual reality video, 4K/8K ultra HD, 3D Blu ray video, etc. 3. Download video to MP4 MOV MKV AVI H264 VP9 MPEG MP3, iPhone iPad Android, etc. 1. Amazing stable video downloading ability. 2. Intuitive interface, friendly to both new comers and experts. 3. Support video downloading with a wide variety of formats. 1. Intuitive interface, simple for all users. 2. Powerful video Effect feature to give you more control on video visual effects. 3. Free download videos from 1000+ websites. 1. Video editing feature is basic. 2. Unable to convert audio files on Mac. 1. Limited website services supported. 2. Not video conversion feature. 1. Can't convert video to HD video format. 2. Lose much quality during video conversion. 3. Not support 360° VR video downloading. Total Video Downloader for Mac ranks as the best one in United States. And it keeps unwavering status of being top-ranked. There is no need to say the similarities with other Mac video downloaders, but what makes it stands out the most cannot be omitted. Total Video Downloader Mac supports to download live streaming videos of SD HD from YouTube, LiveStream and more video sites at 4X faster download speed with maximum stability. Meanwhile, it also supports resuming of interrupted downloads, pausing or canceling ongoing downloads. Specifically, Airy for Mac is more than a Mac video downloader but a YouTube downloader for macOS Sierra. Tiny as it is, but it works powerful on downloading YTB videos and save them as various file types in various resolutions. With this macOS Sierra video downloader, you can easily download Full HD and 4K Ultra HD resolution videos in MP4, FLV, and 3GP formats to your hard drive and enjoy a super quality any time you need it. Additionally, extracting MP3 files from YouTube videos can also be done on this YTB downloader only if you enter the URL on Airy and choose the MP3 format. Similar to Airy, Ummy Video Downloader for Mac is a video downloader faced to more on YouTube videos. It supports downloading YouTube videos on Mac OS X 10.9+, including the latest macOS Sierra. And coincidentally, this Mac YouTube downloader owns almost the same features of Airy, downloading HD videos with sound from YouTube, possibility to opt video format and MP3, MP4 extraction from YouTube Videos. What makes Ummy Video Downloader for Mac better is that it's totally free. So is there any reasons not choosing the freeware between two tools with almost the same features. 2. Able to download live streaming video. 3. Performs stably, no half crashes. 1. Simple solution to download YouTube video. 2. Extract MP3 audio from YouTube video. 2. A nice Mac video downloader for YouTube. 3. The interface is clean and simple. 1. No video conversion feature. 2. Video download sites are limited. 1. Download video only with MP4 FLV or 3GP. 2. Lack bonus features like video conversion, video editing, etc. 1. Single function. No more other features. 2. Can't parse the URL sometimes. It's no exaggeration to say all the macOS Sierra video downloaders we mentioned above are users-friendly and easy to navigate. Here take MacX Video Converter Pro as an example to make you realized what an easy thing for downloading videos on macOS Sierra. 1Free download this video downloader for macOS Sierra and launch it. Click "YouTube" icon to enter the downloading interface. And click "+", then "paste & analyze" button to detect video URL copied from YouTube for example. 2Choose output format, resolution, size etc. from the automatically popped-up window. Generally, you are free to pick MP4, 3GP, WebM, FLV formatted videos in 4K, 1080P, 720P, 480P etc. 3Click "Browse" button to save the downloaded video where you like. 4Press "Download Now" button to start the short process of downloading videos from macOS Sierra. The mentioned video downloader for macOS Sierra will download videos offline to computer, if you need to transfer the downloaded videos to iPhone iPad mobile devices using MacX MediaTrans without iTunes hassle, follow tutorials below. Step 1: Free download the video file transfer for macOS Sierra and run it. Connect iPhone or iPad etc. to computer via USB cable. To prevent data loss, you are suggested to turn off iTunes auto sync at beginning. Step 2: Click "Video", then "Add Video" on the top and select video downloads file from macOS Sierra to transfer. You are allowed to select multiple files to copy in batch. Note that video downloader for macOS Sierra may download videos in MKV FLV MTS and other unaccepted by Android iOS phones tablests, luckily, the iTunes alternative mac can convert the videos to mobile devcies formats automatically fast without decreasing quality. Step 3: Click "Sync" button, and your videos will be transferred to iPhone iPad etc. quickly. It also serves as iPhone file manager to manage iPhone iPad etc. media file in a single click. Look for best YouTube downloader for Mac to download YouTube videos for free? This guide introduces you the best YouTube downloader for Mac that can free download UHD/HD YouTube videos, movies and songs. Seeking for the best free online video downloader from any site? Your search ends here as we will offer you an easy solution on how to free download online videos from any site with the best video downloader as you like. MacX Video Converter Pro is an all-in-one video downloader for macOS Sierra with top quality and fast speed. This feature-rich video downloading software also can help you easily download YouTube videos in 4K UHD/HD 1080p/720p SD with fast speed and high quality.